Ank, G., Paradas, W. C., Amado-Filho, G. M., Gama, B. A. P. & P., R. C. Within-thallus variation on phlorotannin contents and physodes amount in Stypopodium zonale (Phaeophyceae). Pan-American Journal of Aquatic Sciences, 9(1): 1-7. Download PDF file (364 Kb). Carrasco, D., Felippe-Bauer, M. L. & Dumont, L. F. Abundance of Culicoides (Diptera, Ceratopogonidae) species in salt marshes of the Patos Lagoon estuary, Rio Grande do Sul, Brazil: influence of climatic variables. 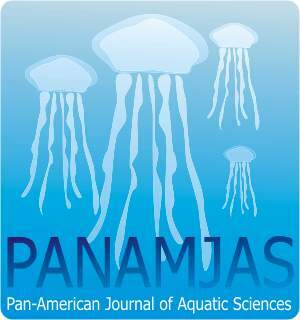 Pan-American Journal of Aquatic Sciences, 9(1): 8-20. Download PDF file (735 Kb). Oliveira, T. D., Reis, A. C., Guedes, C. O., Sales, M. L., Braga, E. P. R., Ratton, T. F., Maia, B. P. & Magalh�es, A. L. B. Establishment of non-native guppy Poecilia reticulata (Peters, 1859) (Cyprinodontiformes: Poeciliidae) in an Municipal Park located in Minas Gerais State, Brazil. Pan-American Journal of Aquatic Sciences, 9(1): 21-30. Download PDF file (464 Kb). Kandratavicius, N. & Brazeiro, A. Effects of wave exposure on morphological variation in Mytilus edulis platensis (Mollusca, Bivalvia) of the Atlantic Uruguayan coast. Pan-American Journal of Aquatic Sciences, 9(1): 31-38. Download PDF file (459 Kb). Skinner, L. F. & Barboza, D. F. Record of coastal colonization of the Lepadid goose barnacle Lepas anatifera Linnaeus, 1758 (Crustacea: Cirripedia) at Arraial do Cabo, RJ. Pan-American Journal of Aquatic Sciences, 9(1): 39-42. Download PDF file (264 Kb). Corr�a, F., Tuchtenhagen, T., Oliveira, E. D. de, Pouey, J. & Piedras, S. Distribution extension of Cyphocharax spilotus (Vari, 1987) (Characiformes: Curimatidae), at Patos-Mirim lagoon system, Rio Grande do Sul State, Brazil. Pan-American Journal of Aquatic Sciences, 9(1): 43-47. Download PDF file (720 Kb). Silva, H. P. da, Souza, F. de & Correa, F. Ichthyofauna of the Bento Gomes River in the Pantanal Matogrossense, Brazil. Pan-American Journal of Aquatic Sciences, 9(1): 48-53. Download PDF file (391 Kb). Bernardon, F. F., Valente, A. L. & M�ller, G. Gastrointestinal helminths of Trachemys dorbigni Dum�ril & Bibron, 1835 (Testudines, Emydidae) from artificial urban ponds in southern Brazil. Pan-American Journal of Aquatic Sciences, 9(1): 54-57. Download PDF file (402 Kb). Ragonese, S. & Bianchini, M. L. Is it time to discard the Rikhter & Efanov�s natural mortality�age at maturity estimator from the stock assessment scientist�s toolbox?. Pan-American Journal of Aquatic Sciences, 9(1): 58-65. Download PDF file (338 Kb). Silveira, T., Bianchini, A., Robaldo, R., Colares, E. P., Muelbert, M. M. C., Mart�nez, P. E., Pereira, E. & Valente, A. L. S. Corynosoma spp. (Acanthocephala, Polymorphidae) in Mirounga leonina (Pinnipedia, Phocidae) of South Shetlands Islands: a new host for Corynosoma cetaceum. Pan-American Journal of Aquatic Sciences, 9(1): 66-69. Download PDF file (144 Kb).